What does the recent Nobel Prize have to do with good public relations agency business practices? No, there’s not a Nobel for PR. But before you nod off in boredom, remember that a sound understanding of contract theory can enable smart negotiation and fair compensation. As you enter into your next relationship with any business partner, it’s a good idea to bone up on the science of contracts. However obscure it seems, this year’s Nobel Prize for Economic Sciences was awarded to two economists who have given the area a great deal of thought, and they make a good case for why PR specialists should also. Here are some of the questions you should ask as you construct your next letter of agreement, based on some of the tenets prescribed by Nobel recipients Oliver Hart and Bengt Holmström. Does the agreement offer each party the right incentives to work together? It’s easy to think that the only motivation needed to enter into a public relations agreement is proper monetary compensation. But that isn’t all. One of the most important things to agree upon in a contract for PR services is duration of the agreement. If a company has a very high bar for success – say, a large number of national placements for a product launch – and is only offering the firm a short-term arrangement, that likely constitutes a contract theory failure. But, then, you probably knew that. Does the contract take future unknowns into account? Hart and Holmström helped pioneer the theory of incomplete contracts, or what to do when the unforeseen pops up, and who decides how to deal with it. Since no one can predict the future and there are too many variables to be codified in a single document, a contract should identify who has the right to make future decisions. This is a significant power that has real resonance with PR agencies. For example, a start-up business with a category-creating product can’t predict who will enter the market as competitors, what bugs will need fixing or how first year sales will go. That’s the kind of opportunity where a firm’s knowledge of the theory of “incomplete contracts” may come in handy. One thing to contemplate with regard to client/agency incomplete contracts is who gets the power to make the future decisions. We imagine the client should insist because they bear the financial risk, but we think some type of a compromise could be struck. Perhaps the power could be shifted each time the contract is renewed? Could an agency exercise more control over the agreement if multiple risk factors occur at once? Could the two parties alternate in deciding? It’s something to think about. Can rewards be linked to performance outcomes? This topic is often debated among PR professionals. Is it a good idea to pay a bonus to an agency who can actually link increased sales to key media results? Or should some additional reward (company stock, for example) be given to the team that meets and exceeds placement goals? On the face of it, bonuses like this seem attractive, but only if base compensation is equitable to begin with. The Nobel team also looked at ways that performance rewards can distort work efforts, sometimes negatively, so they must be negotiated with care. Economists Hart and Holmström argue that companies in lower-risk businesses can best afford to offer their employees smaller base salaries and greater incentives based on performance. In our analysis of the PR business, we conclude that our industry doesn’t neatly fall into the category of “lower-risk” business. We consider PR a higher- risk field based on certain “known” unknowns (C-suite decision-making, business climate, competition and media response to our overtures, to name a few). This is why most in the industry shy away from lowering fees in favor of performance-based incentives, at least during a full-employment economy when competition for talent is fierce. The bottom line is that we should all negotiate with care rather than always blindly following a contract template. Legal agreements have governed the practice of public relations since the days of Edward Bernays. 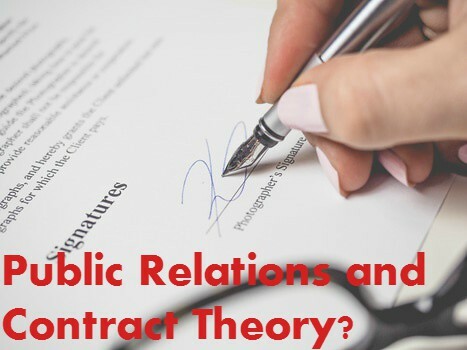 As technology improves and organizations become more complex, the theory and practice of PR contract design will only become more critical to creating and sustaining successful – and profitable – relationships.